In 1982, I reported finding Sitticus floricola in a previous year at the R.S.P.B. reserve at Loch Ken, Dumfries and Galloway. Since then, it has been found several times by the warden in the same general area and also at Loch Stroan, a few miles away. On a visit to the reserve in July 1985, I found this spider to be common and widelydistributed; in fact, it was the second most commonlyencountered species out of a total of 21, only exceeded in abundance by Enoplognatha ovata (Clerck). Not only was it present, where expected, on the wet marsh but it was also in the drier areas, even spun up in dead leaves lying in the grass. Incidentally, another interesting inhabitant of these marshes was Trochosa spinipalpis (F. O. P.- Cambridge). Despite the misgivings that I expressed in my previous note, it now appears that the numbers of Sitticus floricola are so large that the colony is in no danger. Added by John Partridge at 15:27 on Thu 29th Dec 2011. Loch Ken appears on the map as a very long, narrow stretch of water (about 15 km long by about 1 km wide) which lies between New Galloway and Castle Douglas in the old county of Kirkcudbright in Southern Scotland (in fact Loch Ken is only the southern end, the rest is formed by the widening of the River Dee). The whole area is famous for wild geese which winter there in thousands and, as this water is one of the more important sites, the Royal Society for the Protection of Birds has recently acquired a stretch of the western shore as a wildfowl reserve, although it is not yet open to visitors. In July 1981 I was on holiday in Kirkcudbright and I called to see the newly appointed warden of the reserve whom I have known for many years. We went down to the loch-side and he showed me an area, several acres in extent, which is often flooded in winter, but is relatively dry in summer and covered with low vegetation. It was here that we saw signs of spiders spun up in the leaf-folds of tufted hair-grass, Deschampsla caespitosa. There was no cottongrass in evidence and these were quite conspicuous. Some of them turned out to be the work of clubionids, probably C. reclusa, which was found elsewhere in the general area, but, on this site, only immatures were found. 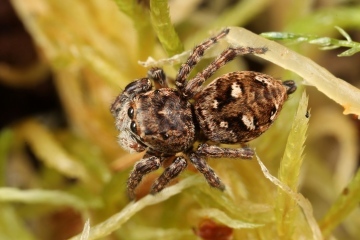 However, the most conspicuous were made by a salticid - Sitticus floricola was suspected and a male and female were taken. This identification was later confirmed. This is only the second known locality for this species in Britain and the first for Scotland. The Nat. Grid Map Ref. is NX 686 696. The discovery of this new colony of Sitticus could prove an' embarrassment to the R.S.P.B. A tentative proposal for the reserve management plan could be to keep this area flooded all year to encourage summering wildfowl since, so far, no particuarly important plant or animal had been found there. However, the R.S.P.B. is very conscious of the need to protect habitats and species other than birds and would probably be very sympathetic towards protecting this rare spider. Now, it could be that this colony is a small part of a population which extends along the loch side and, if this were found to be so, there is no reason why part of it should not be flooded. Consequently, if any members are in the area this summer it would be appreciated if they could spare the time to collect more data regarding the distribution. I am grateful to Dr. P. Merrett for confirming the identification of Sitticus and to Mr. D. W. Mackie, who knows the Cheshire colony well, for helpful discussions. Added by John Partridge at 15:24 on Thu 29th Dec 2011. We were unfamiliar with Sitticus floricola until encountering this spider by chance at Llay Bog, near Wrexham (Nat. Grid Ref. SJ 322554; V.C. 50) on 22nd May 1988. The central acidic portion of this small S.S.S.I. is being encroached due to enrichment, and the Eriophorum uaginatum L. had few flower heads. Several of the heads were sewn up and, on examination of one, a Sitticus floricola female emerged. Both the spider and the sewnup head were collected to provide a specimen for Liverpool Museum. On arriving home we were embarrassed to find that the single head contained eight females, which had vacated their egg sacs. They refused to re-enter these and the eggs failed to hatch. Most of the females were kept alive and fed, and subsequently some did make new egg sacs in dead Cotton Grass heads supplied. The resulting young were released at the site. Familiarity with the appearance of sewn Cotton Grass heads enabled us to find the spider again at Vicarage Moss, Gresford (SJ 360540; V.C. 50) on 5.6.1988. It was using heads of Eriophorum angustifolium Honckeny. On 15.6.1988 males and females were found in heads of E. uaginatum at Bettisfield Moss (SJ 481350, V.C. 40); we did not find any on the adjacent Fenns or Whixall Mosses, but it would be very surprising if it was not present. The careful intucking of loose 'cotton' fibres below spider-sewn heads makes them fairly easy to spot. It seems worthwhile looking for this spider elsewhere during May and June; later than that the Cotton Grass heads become naturally somewhat matted and sewn examples are more difficult to detect. A number of other spiders were found to have sewn Cotton Grass heads: at Bettisfield Moss, Dictyna arundinacea (L.) was the commonest with some Larinioides cornutus (Clerck) and Xysticus ulmi (Hahn); at Vicarage Moss some L. cornutus and Clubiona stagnatilis Kulczynski. This note presents an opportunity to give records from three more sites which we think are unpublished. The Ronald Leighton Collection at Liverpool Museum has specimens from two sites near Abbott's Moss, the classic locality. These were presumably known to David Mackie who was Leighton's mentor and collecting companion. The first is labelled 'Little Budworth Common' and was taken on 20.8.1972. This probably refers to the fine 'schwingmoor' there, which is where Stephen Judd of Liverpool Museum collected it on 24.7.1985. (at SJ 58- 65-; V.C. 58). Leighton's second site is labelled 'Hatchmere', collected on 22.7.1967 and again on 2.8.1970. It is more difficult to decide on the location for this group of specimens. It could refer to the adjacent Hatch Mere where there is a floating bog, or nearby Flax Mere which is a drained mere with a boggy bottom. It could conceivably refer to another bog in Delamere Forest called Black Lake, from where Stephen Judd recorded it on 14.6.1986. (SJ 53-70-; V.C. 58). Eriophorum occurs at all these sites. Christopher Felton of Liverpool Museum confirmed the identity of the various spiders.